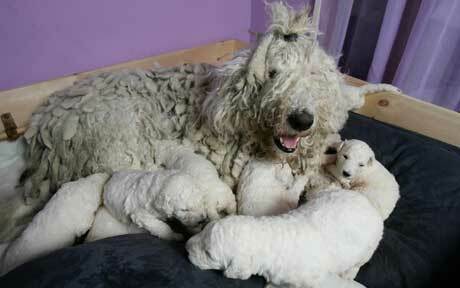 A record litter for a rare dog has seen the UK population of the Komondor dog boosted by 25%. A usual litter of pups for the dog is just four, but new mother Kyra had a litter of nine puppies recently, taking the UK population of Komondor dogs from just forty, to forty-nine. The scarcity of the dogs means that they are also very valuable, as each puppy is expected to sell for £1,000 a piece. The dogs have a unique appearance, as the Komondor dog features natural ‘dreadlocks’, making them the world’s hairiest dog.